As many of you know, my wife and I are going to have a new baby in less than one month. A few nights ago, while washing some ‘onesies’ for out little girl, I noticed something about the laundry detergent cap. On the back of the detergent bottle, there are ‘recommended’ amounts for various types of ‘laundry loads’. For a medium-sized load, the manufacturer suggested that I fill the cap to line “1”. I looked on the outside of the cap and I couldn’t find any numbers. But, on the inside, there they were. Very faintly, there were three lines – 1, 2, and 3. The ‘red arrow’ is pointing to ‘line 1’ – The recommended amount for a ‘medium load’. The ‘black arrow’ is pointing to ‘line 2’ – The recommended amount for a ‘large load’. The blue line (with no arrow) is pointing to ‘line 3’ – This line is not mentioned in the instructions. Why? I have no idea. But, I assure you, there is a ‘line 3’. Now, for the interesting part. The ‘natural line’ – marked in green – and the point to where I’ve always filled the laundry cap in the past – is well above the ‘recommended line’. As you can see, the recommended amount for a medium load is equal to less than 1/4 of a cup. But, the line to which the eye is naturally ‘drawn’ – the green line – is almost 1/2 of a cup. The bottle states that there are 16 loads per bottle – But, that’s ONLY true if you use ‘line 1’ – the line suggested for medium loads. Use any line above ‘line 1’ and you’ll get less than 16 loads per bottle. Use the ‘green line’ and you’ll only get 8! I took a look at two other bottles of laundry detergent that we had in the house – and both of them showed remarkably similar characteristics. So, when washing your clothes, and using store-bought detergents, be sure that you are using the ‘recommended’ amounts – and that you are using the right ‘line’. Edit: This article has been ‘stumbled’. If you’d like to help others find this article – and spread the word – please click here to stumble this post. Thanks! Just think, your insanity is doing us all a public service. Now I won’t have to photograph and measure the washing powder cup for my readers. I don’t think you’re insane, but, if you are, I think insanity is a good thing. Now I’m off to look and my laundry detergent…thanks for an excellent post (and excellent blog!). Even 1/4 cup may be more than necessary. It is worthwhile to experiment by using less and less detergent each time as long as your clothes get clean. I have done this with dishwasher detergent and find that my dishes still get clean with only about a tablespoon of detergent. Those cups that they would have you fill to the brim are probably 8 times that. OK, I don’t feel quite so bad now. 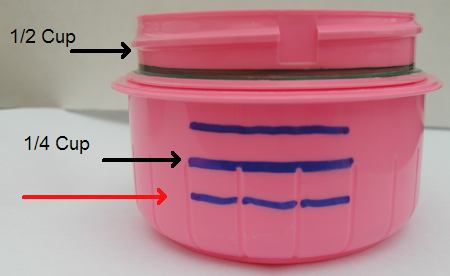 We actually marked the correct fill line on our laundry detergent scoop with a Sharpie permanent marker because our natural tendency was to fill up the scoop and overuse the detergent. Hey, great minds think alike! I have to admit I’m completely guilty of over filling my laundry detergent cap. And the worse thing is I’ve read the recommended amounts and yet still naturally fill to the top. I also do this with my fabric softener. I’m a little bit of a clean freak so I’m having a hard time of convincing myself the appropriate amount of detergent for a “super load” (the one above large on the washing machine). Your post is further encouragement to convince me to not fill so full. Laundry detergent is an expensive line item on my grocery list. Thanks so much, NC, for the tip. Last time I shopped for the soapy stuff, I was looking at a tab of over $20 for a big box. I bet that box would have lasted a whole lot longer…like twice as long…had I known what I know now. You’re a gem, NC. Keep up the great work, and best to you and the family. I’ve wondered the very same thing, so if you’re crazy you are not alone. I’ve always ‘underfilled’ when I put detergent in. I haven’t noticed any significant change by putting in just under the ‘1’ line. Oh, I do NOT think you’re insane – this shows what you’re talking about much better than if you tried describing it in words. And I am usually good about catching these kind of things – like cans of fruits/vegetables. You ever notice how they contain amounts like, 15 3/4 oz ?? The sneaky buggers downsized from 16 oz at one point, kept the same can size and hoped no one noticed! But the laundry detergent totally escaped me. I get a tub of the powder stuff and I am going to go check and see what the scoop actually is. I will probably replace it with a real measuring cup, as I try to underfill but am probably still overfilling! Wow, I have been really overfilling, sheesh. A while back a company started selling a regular blank CD as a “Laundry Disk” saying that it changed the properties of the water to make it a cleaning like solution. Then it came out that was a scam. Turns out that you can use very little soap and still get very clean clothes. However, too much soap can damage your clothing. You ever wonder why all the soap companys switched to shower gels? Because we use two to three times more than if we used a regular bar of soap. I have little liquid soap dispensers at every sink in my house. I guess it looks better than a big old bar of soap, but try to keep the soap down to a pump, even a half pump is usually good enough. Same thing with toothpaste, mouthwash, shampoo, gel deoderant, dish soap and about a hundred other things. NC, you did a good thing by bringing this up. I love those new super concentrated laundry detergents! You can use even less! A big ‘thank you’ to all who have commented and linked. I’ve got a few more similar articles coming out in the next few days. Stay tuned! HAHA! Great job! I’ll be showing this article to my daughters today, since they are the ones in charge of the laundry. My brother stopped at my house and was helping me get stuff done, and brought his laundry, as he was filling up the cup I noticed he had it almost to the top. I stopped him and pointed out the lines, he had been filling the cap to the brim every time, that would be about 3-4 loads, I usually go up to the 2 line with high capacity washer. Thanks for bringing this to everyones attention! I habitually use less than the recommended amounts of laundry and dish detergents. Not only that, I set my washer to it’s shortest wash cycle (35 min) and use cold for nearly everything. I have always been extremely careful with our clothes…am a bit of a freak about it. I haven’t noticed any difference–except in my grocery, gas and water bills! I do wash sheets, dog beds, rugs and other dirty items in hot water for longer time periods…. The new front-loading washers use even less. And don’t use too much detergent because it can irritate your skin. Dermatologists are warning us about that now. When I bought my new front loader, the salesman told me to use 1/4 what I had been using. I save tons of money, and my clothes are cleaner than ever. And, yes, I am a freak about clean clothes! Another tricky thing that the manufacturers have done is change the width of the cap. I noticed a huge difference in Woolite and Downy products. The Woolite opening used to be small, but now it is huge and easy to use way too much. The Downy cap used to be taller and thinner, so you could easily fill it to the appropriate line without going over. Now the Downy cap is so wide that even filling just a tad over means that you have to purchase a new bottle more frequently. It’s all a scam, I tell you! These companies really know how to separate us from our money. Consumer reports did a study on detergent some years ago, and they were shocked to reveal that not only is there barely any difference between different detergents, but detergent was not significantly better at “cleaning” than just running the washer with nothing but water. Note: detergent definitely makes the clothing smell better afterwards. After reading that CR thing years ago, I cut my detergent usage in half and have noticed absolutely no difference ever since. As a relatively new father as well (13 month old son), we did the same thing that you and your wife are doing, bought the expensive “baby detergent” (starts with a ‘D’). Then I did some research and found out that you can just use any of “free” detergents on your baby’s clothes (no perfumes, no dyes). That is basically what “The D” is, it just has that added (baby safe) perfume, and when comparing prices, that perfume is pretty expensive. So although it will probably cut down on arguements with the new, first time mother to not bring it up in the first couple of months. After that do a little research and show her, maybe you can get her onboard too. Stop sending all that hot dryer air outside on cold days. For about 10 dollars you can get a little box that has a flap in it and allows you to vent the warm air back into your house on cold days. This helps to heat and add humidity and doesn’t cost any extra $$$. @mdot – The bottle above was a gift at a shower. We have 2 other kids, and we learned the old ‘free’ detergent rule a long time ago. We usually use one of the ‘die and fragrance free’ concentrated products – and them only until the baby is a few months old. Ever since I moved to Portland, OR, I have always used less laundry detergent than recommended because our water is so soft you would need to rinse the clothing up to three times to rinse out the recommended amount. As others have noted, my clothes are clean and I buy far less expensive laundry detergent that way. Just bought a new Bosch front loader. It only uses 3 tablespoons of detergent. The sensors in the washer will actually make the cycle take longer if you put in too much, because it senses when the soap is rinsed out. check out dropps = no measuring, no mess. you don’t have the same problem of measuring with dropps that you do with traditional detergent. plus it’s great for babies since it comes in a scent and dye free version in addition to the fresh scent. @Zak I will freely, openly, and eternally admit – I am not a genius, and I do not deserve to be heralded! I will, from this point forward, consider myself to have been ‘put in my place’. Thank you! We’re all just messing with you. One of the ways to increase product sales is to make existing customers use more of the product. Larger spouts and tweaking measuring cups are two very good techniques. Persuading customers to use products in new ways is another (e.g. using dryer sheets to freshen up drawers and trash bins), but at least with those you are fully aware of what you’re doing. Another good one is price manipulation. In categories like toothpaste where the consumer doesn’t have much to go on (and can’t be bothered researching), you can actually sell more by raising the price because a lot of people use price as a quality indicator (higher price must mean better product). So, you’re not crazy… just crazy-smart. I always think that manufacturers will tell you to use insane amounts of their products in an effort to make you use up the container quickly and buy another (“Rinse and repeat”). Always downsize from the amount they recommend. My washer repairman said that this is common. They do it intentionally but you don’t need the large amount. I came here thinking some crazy secret about laundry detergent would be exposed. Instead, you tell us to merely follow the instructions on the back of the bottle, which I’ve been doing since I started doing my own laundry back in college. Have you really been filling up the cap to the tippy top this entire time? This is why it pays to read the instructions. I’ve always used less than the directions recommend. However, I recently started using Ecos laundry liquid (available at a good price at Costco) because it is safer ecologically….and it does a GREAT job at cleaning. Moreover, they specify a very small amount of soap – 2 oz. I think. Because their cap marking is not easy to see (they tell me they’re aware of this and will mark it better in the future), I poured the measure into the cap and marked it with a waterproof pen. In addition, I’ve discovered that since the detergent is thick and gel-like, quite a bit sticks to the inside of the cap after you pour it out, so I run it under the incoming water and get all of it into the wash. I don’t know what you’d do with a front load machine – maybe rinse some tap water into the cap and pour it in. Also, I’ve been washing with cold water for two years to save gas from my water heater and note no difference in cleaning results. Thank you cvsdave! I was just about to the post the same thing! Very dangerous to vent a gas dryer into the house…could vent carbon monoxide right back into your house! A dryer vent isn’t just venting heat and humidity if you are drying with gas! Why use laundry detergent at all? Two drops of dishwashing liquid should be about right. A bottle should last for six months. Actually you can use considerably less than that. I used to wash cloth diapers and always had the problem of soap build up. I found out that even when washing cloth diapers, all i needed was just a couple of tablespoons of liquid (enough to fill the cut about 1/2 inch on the bottom) and everything still turned out clean. I can guarentee you (especially if you’re washing jeans) that if you wash your clothes, without any soap in the wash, the water will still sud up. extra detergent sticks to your clothes, makes them feel yucky, and they hold in smells so much more. sirflexalot: actually, that report is false — there is a wide chasm of difference between laundry detergents, and what they will and will not do to your clothing. I read an article a few months ago (Salon? Slate?) where the author did a pretty controlled study of detergents, and there were remarkable differences in color-fastness and cleanliness. The upshot was: uber-cheap detergents will cost you more money in the long run, because they won’t clean your clothes and/or they will alter them pretty quickly. This is a large part of why I started making my own detergent. Another option is to designate a measuring cup for your laundry room and using that to measure each time. whats sad, is that i have known all about those lines for atleast a couple years now but still add extra detergent because I just thought that couldn’t possibly be enough to get my cloths clean. Well, from now on, its the line or less. And I usually use All or Era, both are pretty good brands. Though I have considered trying a home made version. I had to post about my similar experience! I linked to your article as well at Homemaker Barbi. Thanks! I have a huge problem with the new concentrated detergents leaving blue spots all over my clothes and childrens clothes and ruining them!! Not sure if anyone else has experienced this?! Mix all together in container with lid, and use about a tablespoon per wash. Very econimical, good for the environment, and works really well. I’ve been overusing detergent for years! Thanks for the helpful post!!!! No, you’re no insane, you’re just not at all perceptive when it comes to “recommended” amounts and the actual amount it takes to wash a load of laundry, and your unawareness is exactly what companies like this enjoy to get more of your money. Sounds like somebody had been doing your laundry all along until recently, too. The reason for the blue spots on your clothes is you must be putting the detergent directly on the clothes, instead dissolve your detergent in the washer before you put the clothes in the machine. Along with using less detergent, many people do not realize that they can cut down significantly on energy costs by using cold water instead of warm or hot to do their general washing. Your clothes will get just as clean. I attended a seminar last year on saving energy and the speaker told a small story that convinced many in the audience that were skeptical about that. He asked those who used only cold water to wash their clothes to stand up. He then asked one of the skeptical people if the clothes on that person looked clean to them. Their response was “Yes.”. He proved his point. no I put it in after running water, and some of the clothes were brand new so they weren’t soiled or anything. Only have had this problem with the new concentrated detergents. I just bought one of those laundry balls today that claims it will do 90 loads of laundry. It cost me 2 for $10 so I don’t know that it is worth the money but I am looking forward to seeing if it works. I have read warnings about being careful using these new concentrated detergents. Since they are concentrated,the odors and chemicals used are much stronger than the old diluted versions ,( water is removed from the detergent, thus making it concentrated.) Those that may be susceptible to problems with the chemicals or odors are urged to be cautious if using these products so as not to get sick. Every couple of weeks I run all the loads with dishwashing liquid instead of detergent. This helps strip out the detergent build-up. I also use baking soda in the wash and white vinegar in the rinse to extend the cleaning powers of my detergent (I use about a tablespoon per load). If you’re using a dryer, home-made dryer sheets (a washcloth dribbled with your fave fabric softener) will take care of all your scenting needs. Sometimes I like to take a bath in bleach to make sure I am clean to the bone. Afterward I enjoy the swimming pool aroma that clings to every pore on my body. I am terrible, I buy the good stuff and fill the cup to the top and a little more for a boost , silly me , now that I’ve read everyone’s comments I’ve changed my ways and get even better results, thank you ! This sort of reminds me of the back of older shampoo instructions that suggest you wash and then repeat, using the product up in half the time. I never understood why I needed to wash my hair twice. Lately though I have noticed that some shampoo manufactures have taken that instruction off. It’s all a trick to get us to buy sooner. Watch yourselves. The scoop that comes in powdered detergent gets larger when you buy the larger box of detergent. And they routinely change the size of the ones that come in the smaller boxes too. They want you to use as much as you can of the detergent you know. Oh my god get a life! Somehow I couldn’t draw my eyes away (like a train wreck) but I do believe I just waisted precious moments of my life by reading about LAUNDRY DETERGENT! I saw a similar laundry detergent story on my local news yesterday! I’m ashamed to admit that in all my years among die hard frugal folk, I have never once even thought to look at the packaging to see what the suggested amount was, I merely looked at the cup/cap/scoop and figured it was just “too much” and subsequently used less. I read your post and low and behold, my partner has been using THREE TIMES what was necessary for laundry. Because the non-frugal folk who live among us can’t be bothered with eyeballing measurements, I replaced the scoop that came with my detergent with a smaller size. Now, 1 scoop for small to medium loads and 2 scoops for a full load and I am spending about 60% less on my laundry. Thanks for taking the time to be a ‘wee bit’ insane. Wanna really save money? Don’t buy liquid laundry detergent! Powdered is much, much cheaper and usually comes in a paper, rather than plastic, container. If you really, really want liquid, just take the proper amount of powdered…mix with warm water…and add to the load. We live with well water that doesn’t dissolve the dry stuff well, but I’ve figured out that I can just add water at the start of each load to my dry little granular friends! Thanks for THAT interesting post, I usually fill the cap to overflowing, otherwise I cannot smell the goodness of the detergent! Woah I better be more careful. But I am writing because now all my detergents have gone to the “concentrated” version. I am paying the same or MORE for the detergent YET I get less loads washed for the dollar. Example: Arm and Hammer….used to get 32 loads and the concentrate gives me 26!!!!!!! HELLO is anyone else catching on to this ?? They sure aren’t pointing that out in their happy go lucky commercial with their great new bottles. I am soo mad!!! OMG with the new concentrates, only use a teaspoon full at best for a load of wash. I keep a spoon right on my washer. Once the toxic smell of chemicals gets into your clothes, you can’t get them out. Last week I did laundry (for the first time) for our baby’s new cloths due in a week. I was able to find the marks inside easily. Its our mistake if we tend to overlook simple things and assume wrong ones. And I love the focus of your blog. We are phasing our credit cards out & should be able to cancel them completely by the end of the year. Yeehai! Even got to be careful with Seventh Generation laundry liquid detergent (free and clear). They’ve changed their ingredients. And it was totally unnecessary except as a way to make more money by having us keep looking for something that smells good. My wife and I have been using a small measuring cup (maybe a quarter or third of a cup) to measure our liquid detergent into for a couple of years now. We use a front loader washer and our clothes are clean and smell great. Best of all, a big “jug” of Tide (purchased while on sale) lasts forever. We also cut store brand dryer sheets in half when we open a new box. This yelds twice as many loads and we’ve had no static cling issues. Thanks for all the hard work NCN. Keep it up! And all of my 65 years, I’ve been of the opinion that more is better?!? So, I’m now understanding less is more. I’m going to give this a try. What I’ve been doing in the past is changing detergents everytime my laundry starts to become dingy….that has happened to my whites now, which I always took pride in…and now…they look terrible…yet I overfill my detergent cups to overflowing and i’m wondering WHY!!?? Well…I’m giving this a try….and seeing how long it takes to get all this excess out. Might try the vinegar idea too..since I must have a tremendous build up in my clothes. Thanks for this. I usually don’t read blogs like this…but I think this one was beneficial to read through to the end….just to convince me that my old ways were wrong ways. What a SCAM! Don’t get me wrong, I’m all in support of making changes to limit my negative impact on the environment. But, these new concentrated laundry detergents and their over-sized caps are nothing more than a scam to trick consumers into using more product. Believe me, the detergent manufacturers know that consumers are going to instinctly use more than the new teensy-weensy recommended amount. We’ve been using a normal cap full for years and all of a sudden we’re given this concentrated formula that only requires 1/2 as much fluid. Naturally, we’re going to over fill the cap–especially because they make the caps so unnecessarily big and they make the markings so damn hard to read. I would love to know how much more money the laundry detergent companies are making since they started making this new concentrated product. I guarantee, they’re all laughing straight to the bank, while we’re all loosing more of our money. The only thing we can do about it is be informed consumers and read the directions carefully. Know how much you’re using and measure CAREFULLY. Filling just a little above the line will result in significantly more waste, now that the fluid is twice as concentrated. I make my own laundry soap and have for years. It is about 2 cents per load and isn’t perfumy like the store bought stuff. Go to http://www.savemoneytoday.net for the recipe. You are only supposed to use a tiny bit of the homemade stuff too and I have had to restrain myself from using more than the recommended. OH wow! I have really been wasting laundry soap!! i always just though you were supposed to fill it to the top! THANK YOU FOR SHARING THIS. My mom is a laundry detergent violator. She will wash only 10 loads with a large bottle that is supposed to be for 64 loads! I keep reminding her of all of the chemicals in the detergent, some which supposedly can cause cancer. Ugggh! I need to have a scientist call her to tell her of the harm she may be causing to us and the environment. I’m going to give her the homemade recipe someone shared in this blog. I make my own laundry detergent which costs me approximately $0.28 / 4 1/2 liters versus the $14.99 I was paying for the same thing. People ask me does it clean and my answer is ,yes it does what do you think commercial laundry detergent is made of, why wouldn’t it clean. It takes about 10m minutes to make and you can get 10 gallons out of the recipe, which I found on the Dugger Family web site. Y’know, I’m all for blogging and whatnot, but, and I hate to be “this gal”, but isn’t that kind of common knowledge? Cool! Consumer Reports is linking to one of my favorite blogs – NCC! Another thing to look out for. I just purchased Ecos Liquid Laundry Detergent, the directions tell you to use 1/2 ouce (3 capfuls) but the capful is 1 once. So even if you are reading and trying to follow the directions, they leave you confused. I opted for the 1/2 ounce, but only after unwittingly doing a load with 3 ounces of detergent. Wow, all athis time I’m using too much detergent, that is going to stop! Thanks for the photo in the post. I’m going to mark my laundry cap with a Magic Marker right after I get off the computer, so I am measuring accurately. Don’t use vinegar or bleach on stretchy fabrics. Vinegar is great at getting out the excess chemicals/soap residue, but over time it can weaken elastic. So, it’s best used on things without elastic, such as jeans, cotton button-up shirts, towels, washcloths, flat sheets and pillowcases. I don’t use the vinegar on underwear, stretchy tee shirts, or fitted sheets (because of the elastic at sheet corners). Don’t use fabric softener or dryer sheets at all. They make your towels go flat and matted over time. And the fragrance is an irritant to skin and breathing. I have some friends with asthma that switched to low-fragrance or no-fragrance laundry products and household cleaners, and their breathing is MUCH better now. I use Aldi’s laundry detergent. It’s inexpensive ($2.99 I believe for 32 loads), and is very low fragrance, so it’s not making me itch and sneeze when I do laundry or when I change clothes. Vinegar is also great for other uses. I use a spray bottle with 50/50 vinegar and water, and clean most household surfaces with it, such as sinks, mirrors, counters, painted walls, stovetop, etc. I never buy Windex or Pinesol any more. I save money, and my health is better. I’ve been using this for months. It works great in hot or cold water. Clothes smell fresh. Plus Borax is a natural softener, so no Need for Downy. The last paragraph slayed both moi & husband. Thanks for the laugh in addition to the interesting post!! I have 20/20 perfect vision and I can’t see the fill lines on any detergent that Ive ever bought. it’s so painfully obvious these companies are screwing us! I hope they see this comment! it is total bs!! that there doing this! make the lines a different color! !